Peter said, "Lord, did you tell this story for us or for all people?" The Lord said, "Who is the wise and trusted servant? The master trusts one servant to give the other servants their food at the right time. Who is the servant that the master trusts to do that work? When the master comes and finds that servant doing the work he gave him, that servant will be very happy. I tell you the truth. The master will choose that servant to take care of everything the master owns. But what will happen if that servant is evil and thinks that his master will not come back soon? That servant will begin to beat the other servants, men and women. He will eat and drink and get drunk. Then the master of that servant will come when that servant is not ready. It will be a time when that servant is not expecting the master. Then the master will punish that servant. The master will send him away to be with the other people that don't obey. That servant knew what his master wanted him to do. But that servant did not make himself ready or try to do what his master wanted. So that servant will be punished very much! But what about the servant that does not know what his master wants? The servant does things that deserve punishment. But he will get less punishment than the servant that knew what he should do. 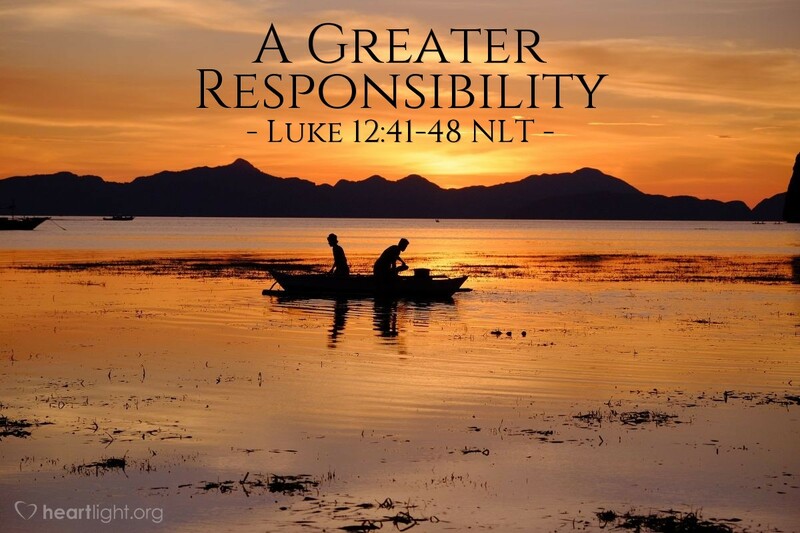 Any person that has been given much will be responsible for much. Much more will be expected from the person that has been given more." Peter's question to Jesus brings home the message for those of us who lead, whether in business, education, friendship, church, or family. We've been given the blessings of grace and influence. How we lead is not just a matter of our group, family, or organization doing well; it is also a matter of honoring the Lord with our best efforts and with holy conduct. He has given us skill, influence, and position to be a blessing to others. If we shirk our responsibilities, if we lead unfairly or harshly, or if we "slack off" in using our gifts, we will be judged harshly. Why? Because the Lord has shared powerfully and bountifully with us. He expects us to do the same. We've been given much; God expects much from us! O gracious Father, I know that you have blessed me in many incredible ways. I want to use my gifts, abilities, and talents in ways that honor you and bless your people. I want to use my influence to bring others to you. I want my leadership to be a blessing to all whom my life touches. May my life bless others and honor the investment that you have made in me. In Jesus' name. Amen.